The U.S pharmaceutical plastics bottles market is fragmented with leading players such as AptarGroup Inc., Amcor Ltd., Gerresheimer AG, and Berry Plastics groups Inc. having fierce competition among themselves. Small and unrecognized companies in the market are making a name for themselves and gaining more shares in the market by launching new products at reasonable prices, and this is intensifying the competition scenario in the market, states a research report by Transparency Market Research (TMR). Some of the players operating in the U.S pharmaceutical plastics bottles market are COMAR LLC., Pretium Packaging Corp., Alpha Packaging, Drug Plastics, O. Berk Co. LLC, and Tim Plastics Inc. 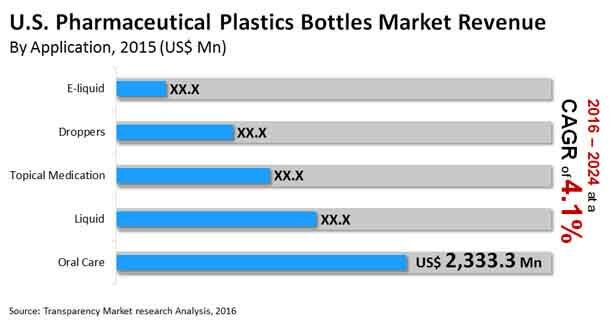 According to the report by TMR, the U.S. pharmaceutical plastics bottles market is expected to rise from US$6.7 bn in 2016 to US$9.2 bn by 2024, expanding at a modest 4.10% CAGR between 2016 and 2024. On the basis of application, the oral care segment will lead in the coming years, reports TMR analysts. By bottle type, the packer bottles segment is most likely to continue leading throughout the forecast period. However, the liquid bottle segment will expand at a higher pace in the period from 2016 to 2024. On the basis of end user, the pharmaceutical companies segment is presently leading in the market and is most likely to retain its hold over the market in the future. The healthcare centers segment is also expected to be a potential market for pharmaceutical plastics bottles. By making use of recycled plastics, the U.S. pharmaceutical plastics bottles market has gained momentum. This shift to recycled plastic has successfully solved the issue of sustainability and environmental impact. This has led to a rise in the use of plastic bottles for liquid and solid medicines, driving the pharmaceutical plastics bottles market. Technological advancements in the field are also helping the market to grow. The pharmaceutical plastic bottles market in the U.S. is challenged by the easy availability of eco friendly alternatives such as metal and glass. As glass and metals are viable substitutes for PE and PET, the market for pharmaceutical plastics bottles is threatened. However, the popularity of plastic is increasing on account of the convenience and safety offered by them. This is expected to continue to ensure a growth of the pharmaceutical plastics bottles market in the U.S.